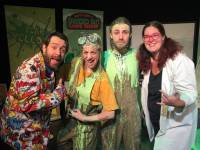 Matty Grey's Grossed Out Game Show is the ultimate interactive live game show for kids! Kids are going berserk over Matty Grey's Grossed Out Game Show! It is a live and interactive game show where two celebrity team captains will lead their half of the audience in a battle of physical challenges and trivial absurdities in order to win! THE GOAL – Win the challenges to earn litres of Slime! THE RESULT – Two dripping celebrities and a laughing audience! The team that wins more, SLIMES more! Hosted by the multi-coloured master of munchkin mayhem, Matty Grey orchestrates this whirlwind of insanity and leads us all on a merry dance towards a green finale that has to be seen to be believed. 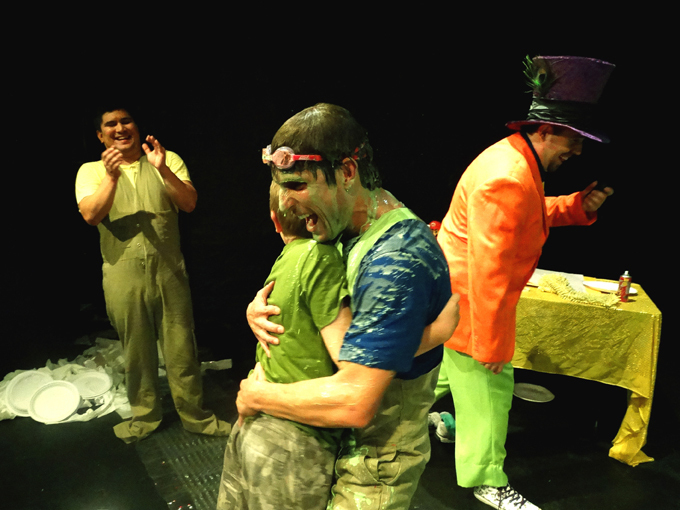 Every performance of Matty Grey's Grossed Out Game Show is a different mix of games and captains, meaning audiences can (and do!) return over and over again for a different experience. Matty provides a brief introduction at the top of the show and welcomes the team Captain and divides the audience into teams. Throughout the show a scoreboard is kept to show how many litres of slime each team has won. The grand finale is each Captain being slimed to raucous laughter from the audience, and Matty Grey leading a sing-a-long of “We Are The Champions”. Each Captain is available for slimey photos with audience just after the show. Tick Tock Dance O’Clock, Mummy Bird, Mars Attacks, Catch a Homer, A Day at the Races and the ever popular Snot Catcher!